thanks for the post. we live nearby and always looking for a nice and cozy place (w/ great and affordable food, of course!) for Sunday family affair :) more power! its a nice place, hopefully makapagwork ako jan..para po kasing ang sarap mgtrabaho jan..im from calauan also and im hrm graduate. my website po ba ang isdaan? How come on every blog i get to see they always miss the basics, like address/direction, contact person and contact info??? sbra ganda nmn,,,,,ill be there on dec30....open kyo sila? the place is really nice.. i want to go there.. how much is the entrance and how can we go there from muntinlupa.? the place is really nice.. how much is the entrance? and how can we go there from alabang? there's no entrance. Its a restaurant. read the direction before the pics at this blog. May mga rooms po ba na pwede mag-stay for example 3 days? pwede po ba magdala ng sarili naming foods if ever?... may place po ba to lay our picnic stuffs if ever? we are planning to go there po in febuary, could u please give us some more details such as the rate of the food and etc. please..... thank you very much! do you have hotels or rooms to stayed if ever? and how much the rate? pede po bang mkuha contact nos nyo? for info. Its a restaurant. there is no room for rent. But you could stay at hidden hills farm. Contact 09272378533.
wat time po ng oopen ang isdaan floating resto? how much is the food for 2 people..? hi, im trying to call ypur number posted above,its not in service!! yung mga nakapunta na dito..baka alam nio yung title ng trance song or techno na pinapatugtog sa entrance..grabe, isa sa mga fill in the blanks ng buhay ko kung anung title non,basta makalabog un,parang mga pinapatugtog sa mga festivals..please pki e-mail sakin kung alam nio..parang awa nio na..plusmultiplyminus@y.c yan po email ko. alam mo na yung title ng song? HI. pde malaman ung directions travelling from lucena? thanks. Tumatanggap po kayo ng credit card? do you accept credit card?? how many travel hours from alabang? hi, this is really helpful,i tried several pages also featuring the Isdaan,but only you have the fascinating way of showcasing ur visit so inviting. i saw the resto on tv, i had to look for it but since i don't even know the resto's name, so i had to rely on pictures, then you got a pic of that Buddha, so i said this is it!!! 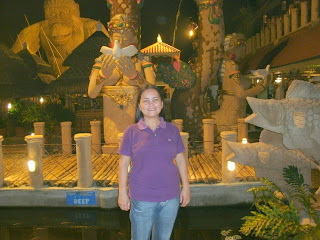 My family is bound to visit Laguna by October.. i enjoyed all ur pictures ,i will really visit this place. Can someone please tell me how to get there? Thanks!! Open po ba kayo ngayung holyweek?plan namin pumunta kasi jan pls reply soon tnx..